Last Friday, Bill Jacobs BMW of Naperville held their second BMW i3 Test Drive Event of 2014 to give customers the exclusive opportunity to try out the latest All-Electric Ultimate Driving Machines. 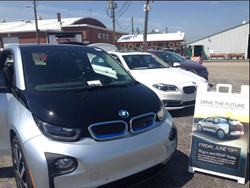 We had a great day for the “Drive the Future Now” BMW i3 Test drive event last week, with over 75 people signed up, and beautiful weather. Guests all enjoyed getting behind the wheel and experiencing the electric performance of the BMW i3. Last Friday, Bill Jacobs BMW of Naperville held their second BMW i3 Test Drive Event of 2014, to give customers the exclusive opportunity to try out the latest All-Electric Ultimate Driving Machines. Bill Jacobs BMW was the first BMW dealership in the Midwest to display the New All-Electric BMW i3 in January of this year at their exclusive Electric and Electrifying Test Drive Event. It was so well attended that Bill Jacobs BMW was happy to provide another opportunity for eagerly awaiting customers to try out this groundbreaking new vehicle. Guests hit the streets of Naperville in six BMW i3s and all who attended the event were amazed at the drivability, sustainability and downright fun that the all new BMW i3 brought to the table. The innovative technology of the BMW i3 allowed for acceleration from 0-60mph in approximately 7 seconds, powered by 170 horsepower and a motor with a maximum torque of 184 lbs-ft. In addition, guests were able to experience the innovative electric power behind the i3, which can go between 80-100 miles on a single charge, and will charge fully in just 3 hours. The release of the BMW i3 is a culmination of BMW’s electric car product development over the last 40 years. This visionary vehicle carries an emphasis on futuristic and modern design. It also equates to a new understanding of ‘premium’ that is strongly defined by sustainability, making it a truly unique force in the automotive industry. Bill Jacobs BMW is proud to introduce these tailpipe emission-free vehicles to the Chicagoland market, and looks forward to more renewable and innovative BMW i brand products that will be coming soon. The BMW i3 is constructed with a Carbon Fiber Reinforced Plastic as its foundation, which means a lightweight vehicle with a more efficient and dynamic driving experience, and greater range capabilities. This material is as strong as steel but is about half the weight, and has allowed BMW to set new standards in both construction and safety. The BMW i3 contains the first-ever mass produced CFRP passenger cell in the automotive business. “We had a great day for the “Drive the Future Now” BMW i3 Test drive event last week, with over 75 people signed up, and beautiful weather. Guests all enjoyed getting behind the wheel and experiencing the electric performance of the BMW i3,” said Greg Joutras, General Manager at Bill Jacobs BMW.